My mother-in-law cooks fine Indian food, particularly south western and north Indian vegetarian fare. Her magnificent table is exquisitely laid with splendid cutlery and crockery for every meal. She made my first meal in her house as her daughter-in-law to be memorable by adorning every part of the home with beautiful fresh flowers and by serving a lavish meal served on silver platters. Despite the family business occupying most of her day, she runs her home with commendable dexterity and her housekeeping skills are awesome. 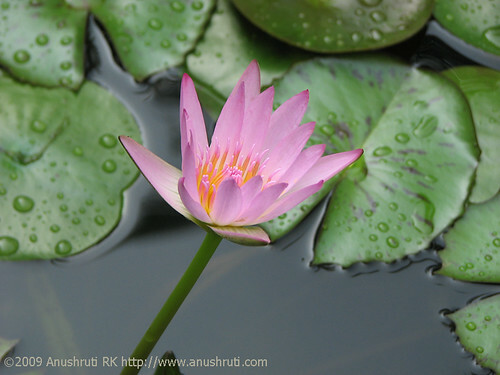 Her household linen is always fresh and crisp and the lotus blooms in her beautiful garden command attention amidst a host of other charming flowers. She made this vegetable preparation alongwith a host of other dishes during one of my visits when I was just getting to know her. I found this way of preparing okra/ladyfinger very tasty and unusual. It had very few spices, carom/ajwain seeds being predominant. What these seeds did to the tomato gravy was quite striking. The combination of these seeds with the okra/ladyfinger and tomatoes introduced wonderful flavours and the aroma was quite unique. Known to have digestive and medicinal properties, I was made to eat a lot of ajwain seeds by my mother during the first month after my son was born. This vegetable preparation also has a special connotation in my life. I prepared it in the afternoon for lunch on the 9th of March this year, just before I went into labour and got the most precious gift in the form of my adorable baby boy. You can cook the okra either by sautéing or deep frying them. I always prefer to sauté them. This can be eaten with rotis, parathas or rice. Clean the okra and dry them properly. Cut them into 1” pieces. Its important that the okras are dry or else they ooze out a pulp and turn stringy when cooked. In a wok or kadhai, heat 2 tbsp oil. Put in the okra and stir for a couple of minutes on a medium flame. Cover with a lid and cook on a medium-low flame until done. Keep stirring in between to prevent scorching the vegetables. Puree the tomatoes in a blender or a food processor. In the same wok or kadhai that you used to cook the bhindi, heat the remaining 1 tbsp oil. Put in the carom/ajwain seeds. After they turn aromatic, about 30 to 40 seconds, stir in the asafetida powder and the red chilli powder. Add the pureed tomatoes and cook on a medium flame until the tomato puree begins to simmer. Stir in the sugar, lower the flame and cook for another 5 to 7 minutes, until the tomatoes are properly cooked. Put in the optional cashew paste. Mix in the cooked okra, add the salt and serve hot. 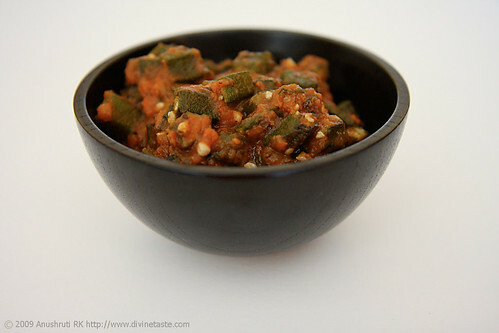 Love the looks of the Okra in tomato sauce. I am always a bit wary of adding tomatoes to okra because of the slime. Cooking the tomatoes and adding the okra is ofcourse the perfect answer. Thanks for stopping by. Great to know yours. I made this dish for a potluck party and it was a big hit..people were amazed that there were very few ingredients here. 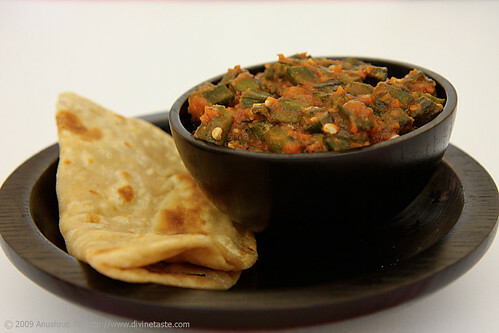 Since fresh okra is hard to find here, I used frozen diced okra, and it worked out well..
Sowmya: I'm glad you and your friends enjoyed this dish. Its quite fascinating how the flavours stand out with such few ingredients. Vidya: Thank you for your sweet words and I'm happy you liked this simple way of eating okras. The ajwain really works like magic here. Pratibha: As much as I like to see comments on new posts, it gives me great pleasure to see comments on older posts which get hidden in the archives. I hope you enjoy the simple yet vibrant flavours of this dish. Plancha gaz au meilleur prix. Pour la plancha gaz, Acheter Mister plancha, le site dédié a la plancha gaz. Toutes les informations pour vous aider à choisir la plancha gaz. hi anu ,i love all ur recipes,but i cannot find ajwain here can i use another ingrident. Simone: Ajwain adds a beautiful flavour here and is a predominant ingredient in this dish. Try looking for it and if you can't then add cumin seeds instead of carom seeds. The flavour won't be the same but it will be delicious all the same. Prepared this dish yesterday and it was really a treat.The sourness and sweetness of the tomatoes,the earthy taste of ajwain and the delicate taste of bhindi, it was a treat.Thanks a lot. I'm very late to be commenting here, but I just wanted to share with you how delectable this was. I made it for post-Holi lunch, and I couldn't think of anything more delicious to end the festivities. Thank you for the recipe!